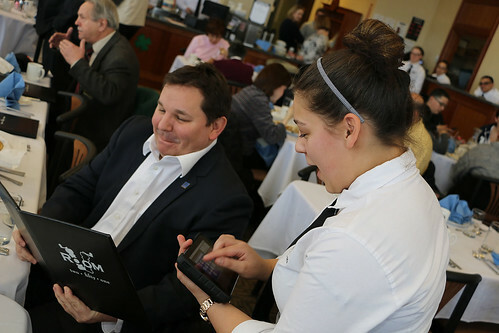 Diman’s Room 251 restaurant has gone high-tech with some help from friends of the school. Already known for its cutting-edge culinary techniques, Room 251 has recently started using the latest technology to manage orders and facilitate communication between the kitchen and front of the house. The POSitouch system cost nearly $30,000 and was purchased with assistance from the Diman Bengal Education Foundation ($10,000) and the William Fusaro Scholarship Fund ($7,500), with the remainder being paid by Diman. This is the fifth project completed with assistance by the DBEF, as they previously funded or helped fund the Stanley Remiesiewicz Customer Service Center in the Automotive Technology shop, a physics lab remodeling, a safe saw for the housebuilding program, and the building of a sports equipment storage facility. April 17, 2014 A $20,000 Foundation check presentation to the school for the first project, construction of the Auto Service Center.